Add a washer solvent to the windshield-washer fluid reservoir for better cleaning. In the winter season, add a windshield-washer antifreeze. Follow the manufacturer’s instructions for the mixture ratio. 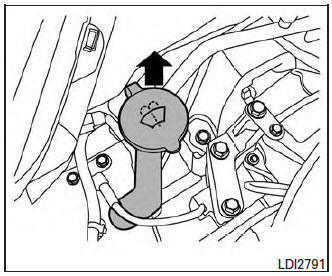 Do not substitute engine antifreeze coolant for windshield-washer solution. Pre-mix windshield-washer fluid concentrates with water to the manufacturer’s recommended levels before pouring the fluid into the windshield-washer fluid reservoir. Do not use the windshield-washer fluid reservoir to mix the washer fluid concentrate and water.